Get your ensemble fiesta-ready with these charming taco socks. Make it a fiesta with these charming men's socks, dotted with perfectly prepared tacos. A festive way to spice up a simple ensemble, these comfortable accessories are fitting finishing touches. Made in South Korea. Taco Socks are a HIT! These look great, vibrant colors. These socks were a hit! What's not to like? Taco socks own the day! I am always looking for something that will make my spouse smile. These socks definitely worked! My son got a kick out of the socks and wears them, of course. I love these socks but they weren't big enough for my son. 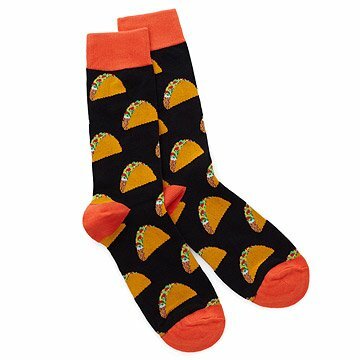 This was a gift and even though I loved the look of the socks, I know my son loves them as they are very whimsical and reminds him of how much he loves tacos. My nephew loves them !! These funky socks are great. They washed up nice. The fit perfect, are warm, and comfy. My husband loves them. Can't answer the pros and cons.....they were a gift for someone else, but they looked and felt very nice.